Art Camp By Gallery Space is an event that took place between 05-Jan-2007 and 09-Jan-2007 in Hyderabad. Does someone watching you closely while you are doing something intellectual, put you under pressure? Here's where you can test if you are alone. Gallery Space, together with Taj Banjara, is bringing 30 renowned artists of India for a 5-day art camp which will showcase their works to the Hyderabadi art aficionados. It is a unique event as art lovers can visit the camp, watch the famed artists in action and interact with them. Eminent artist Laxma Goud, and Sanjay Sood, General Manager of Taj Banjara, inaugurated the camp on 5th January. 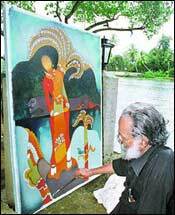 Later Laxma Goud invited all the artists to put their signature impressions on canvas. Over 30 eminent contemporary Indian artists from across the country are attending the camp and will be painting on varied themes. The artists participating in this camp include Adimoolam, Alex Matthew, Aparajithan, Bose Krishnama Chari, Babu Xavier, Chippa Sudhakar, D L N Reddy, Fawad Tamkanat, T Vaikuntam, S Harshavardhan, Shamshed Hussain, Jatin Das, Prabhakar Kolte, Riyas Komu, Sajid Bin Amar, Suhas Roy, Suman Roy, Shipra Bhattacharya, Shuvaprasanna, Laxma Goud, Sudharshan Shetty, Surya Prakash, Pradeep Pottur, Jyothi Basu, P J Stalin, Ramesh Gorjala, V Ramesh, Sunil Das, Kahini Arto Merchant and Seema. The camp is open to all from 11:00am to 7:00pm till 9th January. For further details, please contact Gallery Space at 6554-1836 or Taj Banjara at 6666-9999/2339-9939. Be the first to comment on Art Camp By Gallery Space! Just use the simple form below. fullhyd.com has 700,000+ monthly visits. Tell Hyderabad what you feel about Art Camp By Gallery Space!